I watched the BBC's televised debate about hospital 'closures' several times with great interest as three of our healthcare elite, one passionate campaigner and a number of audience members were given the floor. I even transcribed the whole thing so I could better digest the discussion. 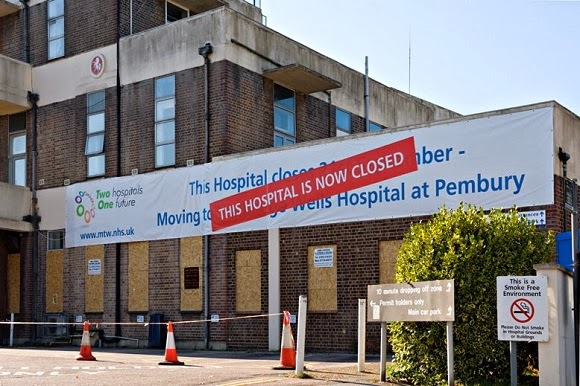 Underlying the debate about availability of hospital services was the imminent attempts of the Secretary of State for Health, Jeremy Hunt, to change the law to empower him to close hospitals irrespective of opposition from local communities or clinical staff. In 2013, Hunt was humiliated in court after his attempt to close maternity and Accident & Emergency services at Lewisham hospital was met with opposition from local government and campaigners and his actions were found to be unlawful in the subsequent legal proceedings. The discussion was opened by Professor Terence Stephenson, a consultant paediatrician and chair of the Academy of Royal Colleges. He was an eloquent and patient speaker with the cadence of a man well-versed in explaining things to students – his handling of host Nicky Campbell's condescending attempt to chide him for a patient/flat-pack furniture analogy was one of unassailable indifference. He spoke a great degree of sense regarding specialist care centres and how reaching the best expertise far outweighs the inconvenience of travel. His demeanour had an authenticity about it which suggested that mix of resignation and compassion which is the battle scar of the NHS veteran. Who could argue: as a medical practitioner of many decades of experience who has risen to the peer-elected position of chair of a respectable Academy, his insight is undoubtedly of huge value when it comes to delivering the best specialist care in a controlled hospital environment. His grasp of what is involved in transporting patients seemed a little convenient, conjuring the images of no one being further than 30 minutes from a hospital and of paramedics arriving at your door in 3 minutes. It would be a wonderful if this kind of pre-hospital environment existed. Perhaps the Professor is so focused on his specialisation that he hasn't noticed that ambulance services across the country are crying out for more resources as they continually fail to meet targets a lot less fanciful than those he describes. Also consider that, for ambulance services, every one of the Professor's extra 30 minute journeys to hospital comes at the cost of the availability of one ambulance for at least one hour. Every A&E closed according to this logic effectively devastates the local ambulance cover unless ambulance resources are doubled. The additional demands of extended trips to convey patients directly to far-flung specialist centres, whilst improving outcomes for the patient on board, also harms the service's ability to respond to emergencies. It's a forgiveable oversight for the senior clinician arguing to support his field of expertise – it's not surprising that the medical elite are not well-informed about the army of junior clinicians who fight to keep patients alive long enough for them to receive specialist treatment in the first place. Those who don't get as far as the specialist centres won't be included in their admission statistics anyway. Despite this, Professor Stephenson was a very credible orator who certainly gave good account of why specialist centres are so important. An Interesting Conflict or a Conflict of Interests? Beside Professor Stephenson sat Dr. Julia Manning, an optometrist who supported the Professor's assertions with talk of patients being treated in the community and being contacted via Skype, because 'we're not using the technology in the way we should'. Here was a woman about whom I was was less convinced. Just a little digging into her background sets off alarm bells as it transpires she's a vocal advocate of private enterprise within the NHS and the chief executive of a 'think tank' – that woolly description for organisations with high-level influence, questionable agendas and no accountability - which may have a conflict of interests. Just watching the video below on the healthcare lobbyist encampments surrounding Westminster is enough to inject anyone with a healthy mistrust of corporations such as those with which Dr. Manning is involved. Perhaps I was being unfair, but I found myself doubting Dr. Manning's sincerity and, by virtue of the fact she was fighting from the same corner as Professor Stephenson, I wondered what influence she had on his stance. With so many private interests muddying the waters of what should be an ethically-led debate, who can we trust? Was my feeling of unease because their talk of radical changes to the NHS invoked a primeval fear of change? I have to admit, their calls identifying the need to update a 20th-century system to meet 21st-century demands made a lot of sense. I have done much personal teeth-gnashing at some of the dogmatic nonsense which plagued my operational paramedic career. But it is hard to have faith that we will see the right changes put into effect when so much is being mishandled already. As Caroline Molloy pointed out with the 111 non-emergency medical information service debacle, using technology often doesn't improve matters. 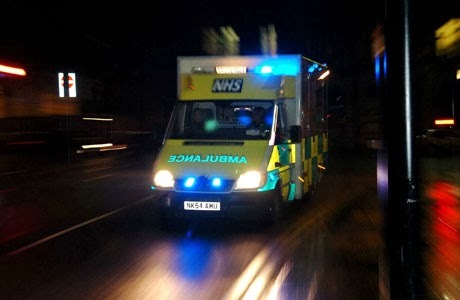 From the ambulance perspective, 111's predecessor NHS Direct (jokingly referred to to as NHS Redirect) wasn't without its problems either, with both telephone triage systems relying on dumb algorithms followed by non-clinical staff which often generated ridiculously inappropriate emergency referrals. The simple fact is you cannot short-cut professional care with technology. We should remain wary of catchphrases involving buzzwords like 'efficiency' and 'dynamic'. As healthcare practitioners on the front lines have learned, these tend to mean staff being pushed harder for longer with less resources whilst chief executives congratulate themselves on a job well done. The committee-led processes which see these kinds of systems put into effect invariably seek to cut corners and trim costs, resulting in the dilution of whatever the initial vision was into something which just punishes staff and fails patients. Why is it that the idea of having some redundancy in a system is, bizarrely, considered 'inefficient' rather than 'safe'? If a system is being constantly pushed to capacity, and any slack trimmed away the moment it's identified, why is it a surprise to anyone when it becomes unable to cope when conditions change? Case in point: echoing Dr Manning's vision of primary care in the community, the 2005 Bradley Report aimed at facilitating UK ambulances 'Taking Healthcare to the Patient', painted a picture of providing a hospital standard service to the door with 'effective mobile healthcare'. This resulted in ambulance trusts adopting a far broader healthcare remit but never seeing the funding required to make it work. Effectively all that happened was that the workload increased but had to be dealt with using the same resources, meanwhile, other care pathways were abandoned with the expectation that ambulances would have it covered, leaving the patient worse off. 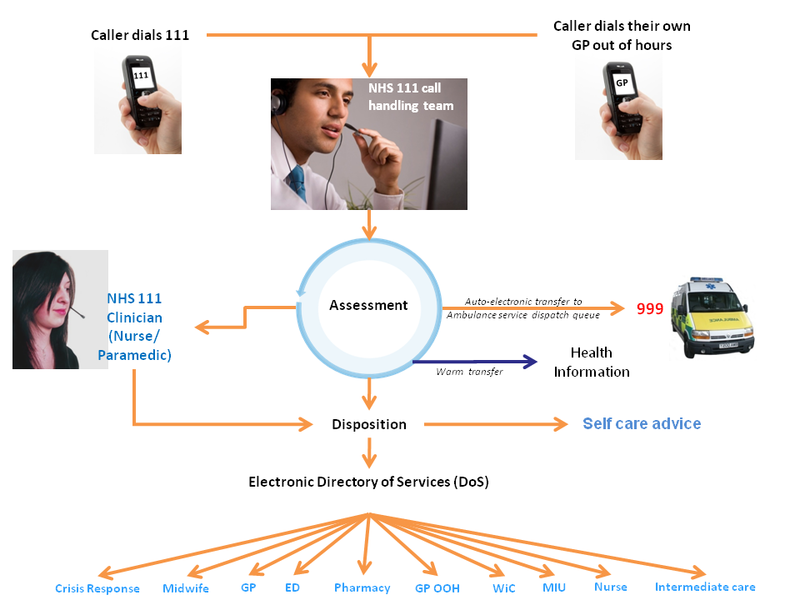 More recently, in the East of England Ambulance service, dynamic deployment was a concept sold as a way of using technology to calculate and provide more effective emergency cover, allowing the delivery of pre-hospital care more intelligently and appropriately. But this was not used to actually increase the capability of the service and improve patient care, instead it was used to justify reducing ambulance cover and engaging in clock-stopping practises of questionable clinical value. With these examples in mind, I wholeheartedly agreed with Caroline Molloy's suspicions that shoehorning technological solutions into NHS problems can and often does lead to calamity. Add to this the private enterprise temptation to increase profit margins and you have a perfect storm which will undoubtedly lead to rising healthcare costs with increased risk of uneven or declining standards. 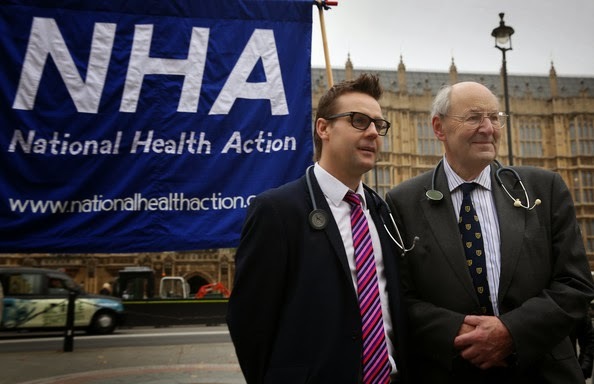 Dr Clive Peedell's appearance in the debate was of particular interest to me, given that he is the co-founder of the National Health Action Party, an organisation formed to fight for the NHS in light of of the ransacking and demolition it is receiving at the hands of recent governments. The NHAP ideology is one that I wholeheartedly believe in and it was encouraging to see the figurehead explain his position on a national platform. I found it refreshing that he showed awareness of how the forces in play impact on the pre-hospital environment and made a case for why local hospitals are a vital part of the system, both in terms of providing for the local communities and supporting ambulance services. The key difference between his stance and the argument put forward by Professor Stephenson and Dr Manning was one of funding and resource distribution. Whilst they espoused the virtues reducing services to pay for high quality specialist care in a handful of centres across the country, Dr Peedell showed a greater awareness of the realities of the functioning of the healthcare system and the fact that outside of the ivory towers of specialist care there is a living, breathing ecosystem which also needs support. It was also encouraging to see that, in many cases, all of the debaters were pushing in the same direction. I remain hopeful that all healthcare practitioners, irrespective of social standing, specialisation or location, are driven by the altruistic desire to do the right thing, not the politically or financially expedient thing. We've got a wonderful healthcare system which has been battered by the modern forces of greed, complacency and short-sightedness. But with the right direction, it is still capable of recovering. It certainly deserves more than to be thrown out onto the streets.